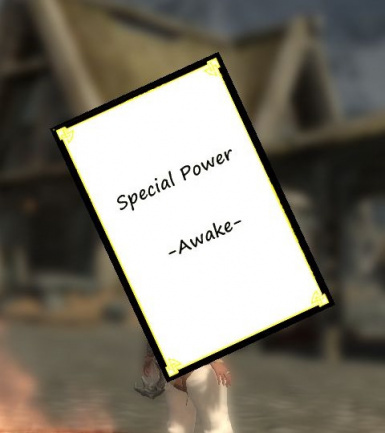 This MOD adds some special powers. There are some types in power. - Power which strengthens myself for a definite period of time. - A cool time is very long. - The cool time of this differs from others. - Power of other type can be used while the cool times of this. >> This MOD adds some spells that pull or move by the rope, a chain, and spider web. >> I referred to the script and used a part of mesh file. >> I used mesh and texture for spell tomes. - Power like a melee. - Performance is the same as any shouts. - A magic bomb is summoned. If it was attacked or passed for 5 seconds, will explode. Regenerate Health faster for 30 seconds. After using, the cooltime[Awake] for 120 seconds is required. Performance is the same as "Histskin". Regenerate Magicka faster for 30 seconds. Performance is the same as "Highborn". Regenerate Stamina faster for 30 seconds. Performance is the same as "Adrenaline Rush". Caster gets perfect magic-resist for 30 seconds. Performance is the same as "Become Ethereal" LV3. After using, the cooltime[Awake] for 30 seconds is required. "[Awake] V - Elemental Fury"
Performance is the same as "Elemental Fury" LV3. After using, the cooltime[Awake] for 60 seconds is required. Caster is invisible for 30 seconds. Activating an object or attacking will break the spell. Performance is the same as "Slow Time" LV3. "[Burst] Melee - Throwing Dagger"
Damage is dependent on the equipped weapons skill. "[SP] Ammo - Throwing Dagger" is required. It can be create from a blacksmith. "[Burst] Melee - Dual Wield Poewr Attack"
This attack has sweep and stagger effect. After using, the cooltime[Burst] for 10 seconds is required. "[Burst] Melee - High Poewr Attack"
A target is blown away with a powerful power attack. This power has no cool time. "[Burst] Melee - Full Swing"
A shock wave is raised by full swing. "[Burst] Melee - Berserker Rush"
Weapon speed increase for 5 seconds. It attacks simultaneously with cast. 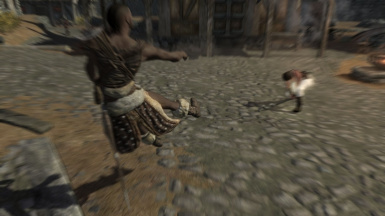 "[Burst] Melee - Hook Shot [Pull]"
An enemy is drawn near with a rope. "[Burst] Melee - Hook Shot [Move]"
Use rope with spearhead Lift up to Target distant. This power has no cooltime. "[Burst] V - Animal Allegiance"
Performance is the same as "Animal Allegiance" LV3. After using, the cooltime[Burst] for 60 seconds is required. "[Burst] V - Aura Whisper"
Performance is the same as "Aura Whisper" LV2. After using, the cooltime[Burst] for 20 seconds is required. "[Burst] V - Clear Skies"
Performance is the same as "Clear Skies" LV3. Performance is the same as "Disarm" LV3. After using, the cooltime[Burst] for 30 seconds is required. Performance is the same as "Dismay" LV3. After using, the cooltime[Burst] for 45 seconds is required. "[Burst] V - Dragon Rend"
Performance is the same as "Dragon Rend" LV3. "[Burst] V - Fire Breath"
Performance is the same as "Fire Breath" LV3. "[Burst] V - Frost Breath"
Performance is the same as "Frost Breath" LV3. "[Burst] V - Ice Form"
Performance is the same as "Ice Form" LV2. "[Burst] V - Kyne's Peace"
Performance is the same as "Kyne's Peace" LV3. "[Burst] V - Marked for Death"
Performance is the same as "Marked for Death" LV3. "[Burst] V - Throw Voice"
Performance is the same as "Throw Voice". "[Burst] V - Unrelenting Force"
Performance is the same as "Unrelenting Force" LV3. "[Burst] V - Whirlwind Sprint LV0"
Performance is the same as "Whirlwind Spring" LV0. Although this power has short migration length, it can be used without any restriction. "[Burst] V - Whirlwind Sprint LV1"
Performance is the same as "Whirlwind Spring" LV1. After using, the cooltime[Burst] for 5 seconds is required. "[Burst] V - Whirlwind Sprint LV2"
Performance is the same as "Whirlwind Spring" LV2. "[Burst] V - Whirlwind Sprint LV3"
Performance is the same as "Whirlwind Spring" LV3. A magic bomb is summoned. If it attacked or was attacked or passed for 5 seconds, will explode. After using, the cooltime[Burst] for 10(30) seconds is required. "[Burst] Summon - Exploding Wolf"
Its damage is dependent on Destruciton skill. "[Burst] Summon - Homing Soul Mass"
Its damage is dependent on Conjuration skill. If the specific perk of conjuration skill is obtained, a damage will penetrate magic-resist. Specific perk are "Novice of Conjuration" etc. "[Burst] Other - High Wind Spring"
Moves to the target location in a jump. "[Burst] Other - Tail Wind Walking"
Move speed increased for 5 seconds. 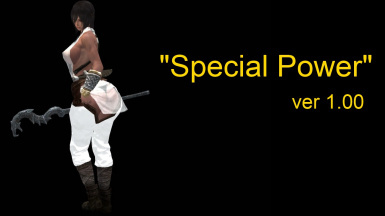 First, "[SP] Recipe : Special Power" is created by blacksmith : Other. While having it, each spell tome can be created by blacksmith : Other. If it is excepted from an inventory, it will not be displayed on a craft menu. If you learn "Melee - Throwing Dagger", ammo required for it can be created by blacksmith : iron. - "Higg Wind Spring" and "Tail Wind Walking" can be used in jumping. - The effect of HookShot [Pull] is changed according to distance. >> An effect becomes strong, so that distance is long. >> However, there is a limit. - The cool time of Full Swing, High Power Attak or HookShot [Pull] are changed into 0 deleted. - Damage of "throwing dagger" and "full swing" came to be subject to the influence of difficulty. - "Summon" type is added.